What better way to celebrate the beginning of April than to see COLOR. Kenneth Noland’s (1924–2010) painting named for this month makes me think of blue skies with a bright sun and the smell of mown grass. (I know everyone loves that smell when spring weather starts getting better.) I’m particularly fond of this work because of the use of cobalt blue and secondary colors from it, including the outer ring with dark blue outlines that verge on violet. And we all know that blue and yellow equals green. This painting has it all—primaries, secondaries, and complements! April is transitional to Noland's later circle paintings. While the inner rings are tightly controlled in their description, the outer circles tend toward irregular contours, with the outermost circle a painterly ring of cerulean blue. This may reflect a hangover effect of Abstract Expressionist action painting. Another source for the radiant energy of these concentric circles may be early American modernist sun paintings such as Arthur Dove’s (1880–1946) Red Sun (1935, Phillips Collection) or Georgia O'Keeffe’s (1887–1986) Evening Star III (1917, Museum of Modern Art, New York). Color Field painting is sometimes called “post-painterly abstraction” to denote that the artists who were part of the style rejected the idea of individual brush gesture, the hallmark of action painting. Hard Edge painting evolved from Color Field, which emphasizes a total unity of surface with sharply defined forms contrasted with blank canvas, avoiding the appearance of figures on a field. Born in the art colony town of Asheville, North Carolina, Noland studied at nearby Black Mountain College (1946–1948), working with Minimalist Ilya Bolotowsky (1907–1981) and geometric Color Field artist Josef Albers (1888–1976). After a year in Paris in 1948, he returned to the US, moving to Washington, DC in 1949. His paintings from this time reflect the all-over painting abstractions of the European counterpart to Abstract Expressionism, l'Art Informel. Noland frequently returned to Black Mountain for visits. In 1950, he met Helen Frankenthaler (1928–2011), an artist who was experimenting with staining raw canvas. He also met art critic and champion of Abstract Expressionism Clement Greenberg (1909–1994). Through them, Noland became aware of Abstract Expressionism. Noland immediately began experimenting with Frankenthaler's staining style for his own brand of Color Field works, abstract canvases saturated with pure color. Returning to Washington, he encountered a group of painters known as the Washington Color School Painters, among them Morris Louis (1912–1962), who, like Frankenthaler, stained raw canvas with pure color. Noland's first completely unique statements of Color Field lasted from the mid-1950s to about 1962, after he had discovered the center of the canvas as a focal point for his compositions. 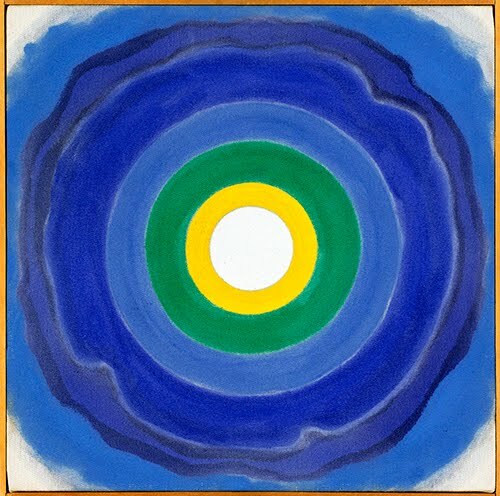 This resulted in paintings where the principal image of concentric circles is exactly centered on the square canvas. In emphasizing concentric circles, Noland eliminated the time-honored method of looking at a painting from left to right.